Right so this may be slightly swayed by the fact we lost today and were absolutely dreadful but here goes! Today was ‘Football for a Fiver’ day at The Valley which might as well be ‘find a moron and bring him along day’ judging by the majority of newcomers that decided to waste their Saturday afternoon in SE7. When the price of tickets is reduced it is like a magnet for all the plastic fans to come out of the woodwork. Now when you’re Chelsea or Arsenal that’s fine because these people can watch the games on Sky and at least have half a clue of what’s going on. Let me tell you Charlton armchair fans are a whole different breed of idiot. Having settled in my seat prior to kick off the excitement was beginning to build when over the tannoy I hear the two teams I dislike the most on this planet have drawn at Selhurst. Good news I think to myself, until some cretin a couple of seats down from us says “where’s Selhurst Park?”. Little did I know this was a sign of things to come. A complete lack of local knowledge is one thing but throughout the afternoon I began to get more and more frustrated by the people around me. I must reiterate that this opinion has been exaggerated by the performance on the pitch but there isn’t enough time in the day to cover those problems! Now call me crazy but if I’ve spent money on something (albeit just a fiver) I’d try and get there on time. Common sense you say? Not to the Charlton armchair fan who has decided to turn up after kick off with a stupid grin on his face to say “we’ve all done it”. I haven’t mate and I’m pretty sure the 16,000 people who come to every other game haven’t either. As the game went on it was apparent the guy behind me clearly just wanted to come to the football but was stuck with his little boy for the afternoon. Don’t get me wrong we all had to start somewhere but this kid spent every moment of the first half asking to go get something to eat until his poor dad gave in after 40 minutes and went up to the concourse not to return for the second half. If the kid doesn’t want to come, don’t force him, he isn’t going to enjoy it! Being a Charlton fan I’m pretty used to us being behind at home against a team you’d think we would beat. That doesn’t make it any easier or any less frustrating. So after one failed attack I look around me expecting to see my fellow Addicks feeling the same pain. But to my horror most people around me appear to be women who don’t seem to know what day of the week it is, let alone the score! I imagine there were a few regulars about who were interested but by this point I was beyond logic. So as the final whistle went and the Charlton armchair fans let out a slight boo, probably because that’s what people do when you lose apparently, I thought to myself is it really worth it? I’m sure the club get a slight financial boost on the day but the purpose of these offers is to get new fans to come back when the tickets are full price. This just doesn’t happen because the people who come to these games, quite frankly are just looking for a cheap day out not a lifelong hobby. So there you go, rant over. Until Tuesday that is! An international break traditionally means a few things. England being rubbish, Scotland being worse and the Germans winning with ease. But a new trend has started on these weekends – Non-league Days. James Doe, a QPR fan, was the brains behind the idea for supporters of Premier League and Championship teams to visit their local non-league side when they have a week off. So with the mighty Addicks not having a game I dragged my brother down to Maldon and Tiptree to see them take on Ware in the Ryman league North. The score was 4-3 to the home side in what turned out to be a thriller but this was only half the story. A Saturday afternoon at the Wallace Binder Ground was completely different to one at The Valley that I am so used to. With tickets at a reduced £5 each I was already in a good mood as I entered the ground and after a brief conversation with the guy on the turnstile I knew I was in for a good day. A few words about why we were there and a cheeky jibe about rather being there than at more local Colchester United was all it took to realise staff appreciated every person they serve when the attendence is closer to 100 than 20,000. Free entrance to the club bar with proper beer on tap rather than the watered down rubbish you get at the higher level grounds was also a positive. While sitting in the bar we came across a couple of the more ‘eccentric’ local fans. The first of which neglected to actually introduce himself and decided to fast forward straight to the fact that one of Maldon’s players was a distant relative of the great Jimmy Greaves and we should watch out for him. This was one of those situations where you either stand there hoping a hole is going to appear in the ground and swallow you up, or you embrace the character that has approached you and humour them. For some reason we chose the latter and the conversation continued on to Maldon’s manager Terry Spillane who has apparently come from Redbridge in the close season and brought 7 players with him. One of the quirks of non-league football that you just don’t get in the professional game. Although I imagine Redbridge aren’t overly happy about this as we later found out the are second from bottom in the same league as their former manager’s new employers! Having escaped the grasp of what appeared to be Maldon and Tiptree’s biggest fan we took our seats and the football started. Despite the quality of play being noticably lower than that of the professional game there is something about non-league that really is enjoyable although a bit odd. Sitting in the stand people are discussing the other scores of the day, both in the same league and other local clubs. It is also nice to hear people with an unbiased view at a football game. A smaller attendence also means that you feel a lot more involved in the game. You can hear the remarks made by the players and officials which does add something to the atmosphere. Don’t get me wrong I’m not going to cancel my season ticket and join the nutter in the bar at Maldon next season but it was a good day out! So next time England disappoint on a Friday night, get down your local non-league ground and try something completely different. You never know you might get the non-league bug! The press have spent the whole week talking about issues off the pitch with both Ashley Cole and John Terry the main talking points. It would be easy to forget that on Friday evening there is a game to be played. Against the mighty San Marino of all teams! One thing is for sure, Wayne Rooney will be tackled by ‘Paolo the Centre Back’ and the commentators will mention that ‘Wazza’ is on about £200,000 a week while Paolo is actually a pig farmer by day and doesn’t really know the rules. Whatever the result and whoever else retires from international football before the World Cup one thing will remain. It could be worse. Our opponents tomorrow night aren’t the most well-known in international football. In fact the only reason they are known is that they are the perennial whipping boys of any qualifying campaign. With a record of one win and five draws in 114 games, and 473 goals conceded you could forgive San Marino for just not bothering with the trip to Wembley. They are in fact the joint worst team in the world according to Fifa’s rankings. Statistics like that lead to one question. Who on earth did they manage to beat? The footballing powerhouse Liechtenstein were the unlucky side, on the 28th April back in 2004. Surely England won’t be the second team to suffer that embarrassing fate. Will they? 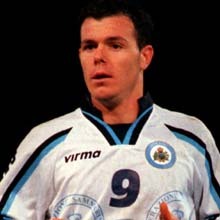 The goalscorer that night is San Marino ‘superstar’ striker Andy Selva. He is the leading goalscorer for his country with 8, however that wasn’t the hardest feat as he is also the only player to have scored more than twice! The 36-year-old is in the squad to face England and will be looking to add to his goal tally against a less than worried Joe Hart and pals. Selva is back playing his club football in San Marino along with the majority of the squad. Only midfielder Mirko Palazzi is playing outside of their homeland, for third tier Italian side Rimini. In fact one of their players doesn’t even have a club but still got the call up! So who’s got the job of managing the unmanageable I hear you ask? That man is Giampaolo Mazza, who unbelievably is the longest-serving manager of any European national team, leading the side since 1998. England’s possible debutant Jonjo Shelvey was just 6 years old when Mazza took the position as manager of the worst team in football history! If England don’t win tomorrow it will be the biggest shock in football since Steve McLaren was seen with his brolly on the touchline, and many will be calling for Roy Hodgson’s head. In fact when Latvia drew with San Marino, their manager at the time, Gary Johnson, resigned due to the humiliation. So poor Roy really is in a lose-lose situation. If we win by a few goals then everyone will say “so we should they are San Marino”, and if the unthinkable happens and we don’t win then Roy may as well get his coat and leave the country for good! So spare a thought for the travelling fans of La Serenissima when we’re moaning that it’s only 4-0 after an hour, it really could be worse! Every team is different. Every set of fans has their own unique chants and match day rituals. Every club plays a song when the two sets of teams emerge from the tunnel. These songs vary from one club to another with differing levels of relevance. My team, Charlton, run out to the Red Red Robin by Billy Cotton, which growing up I thought was very original and a bit quirky. Until I found out Bristol City have the same song. Fair enough as they are nicknamed ‘The Robins’, so I’ll let them have that even if it is slightly soul destroying! Even with this slight setback I still find the upbeat tune motivating enough to get me going before every home game. This got me on to thinking about other clubs and if their respective songs provoke a similar reaction amongst their fans. Having followed Charlton to various grounds some entrance songs stick in the memory more than others. Mostly because they are rubbish! Wigan Athletic playing a song from the Gladiator soundtrack comes to mind! As I said some clubs do seem to have a slightly more unique entrance song than the mighty Latics. Man City for one come out to a slightly rocky version of their terrace favourite ‘Blue Moon’, while everyone knows Liverpool have the ever-distinctive ‘You’ll Never Walk Alone’ by Gerry and the Pacemakers. It does appear clubs with a bit more history are the ones with a more unique choice of anthem. So from the sublime to the ridiculous. Following on from Wigan’s odd choice there is West Brom with ‘Insomnia’ by Faithless and Queens Park Rangers with ‘Papa’s got a brand new Pig Bag’. Nope that’s not a typo that really is the song they come out to! The most bizarre though has got to be Aston Villa coming out to the theme to Thunderbirds, not exactly motivational is it? Now I know this doesn’t affect the result of a game and in the end it doesn’t really matter, but hey its been a slow day! So next time you’re watching your team home or away have a listen just before the real action starts and you might get a funny surprise! It may be one of those clichés that gets regurgitated every weekend but the past couple of weeks as a Charlton Athletic fan have once again proved this true. We’re not blessed with too many good times down at The Valley but last season was genuinely enjoyable as the team ran away with League 1 on the pitch and everything finally seemed stable off it. But as most football fans will tell you it won’t stay that way for long! A few weeks ago the tension was building towards the first South London derby of the season against Crystal Palace. The first of these hotly anticipated derby games for four years. Now it may not be ‘el classico’ or the Manchester derby but it’s more than just your average game of football. So when the day of the game finally came around I spent the whole day at work thinking of nothing else. Not a massive surprise then that my beloved CAFC didn’t turn up on the night and we stumbled to a 1-0 defeat. A defeat in a game against your local rivals is depressing for any football fan, but I was sure we’d bounce back even after another defeat away to Derby County a couple of days later. A good win away to Ipswich was then followed by two home games against a Blackburn side in turmoil after the Steve Kean saga and Watford, who don’t exactly put the fear of God into opposition fans at the moment. The optimism was there, we were about to go on a little run, catapulting ourselves up the table into play off contention. And what do we do? We draw with Blackburn Old Boys despite having chances to win and lose to Udinese Reserves even though they have ten men for 45 minutes and we have about 80% possession, or so it seemed. So there I am on the verge of fully fledged football depression. I can’t see where the next win is coming from, I’m starting to doubt Chris Powell like a Christian changing faith and the thought of possible relegation back to League 1 really does make me feel sick. 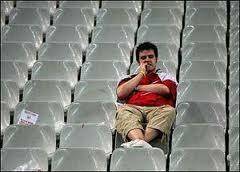 I mean who really wants to play Stevenage away! Blackpool away is the game I’ve been dreading with young Thomas Ince tearing defences to shreds all season and Kevin Phillips guaranteed to score against us like every other game he seems to have played in his 128 year career. Fast forward 90 minutes of nail-biting, nervous shouting and hopeful superstitions and somehow we have actually won 2-0 away! Unbelievable! But when the immediate joy of such a great result fades away slightly, I realise that this little series of results is a microcosm of life as a football fan. Or at least a fan of one the slightly more unpredictable clubs. You get built up to the point of not being able to talk about anything else to anybody that will listen, then you get knocked back down to earth and even the sound of the Match of the Day theme tune makes you want to put your fist through the TV! Then the cycle starts all over again. Sometimes these highs and lows go on slightly longer than just a couple of weeks but inevitably the tide will turn, and its this underlying thought which is why I and millions of other football fans will keep coming back for more torture every Saturday afternoon. It really is a funny old game!